I hoped to have a Manicure Monday up last week, but I didn’t have the time, so I’ll hop right into this one! Right hand. The better of the two. Paint all your nails with a base coat. Paint all your nails with two coats of your base color. 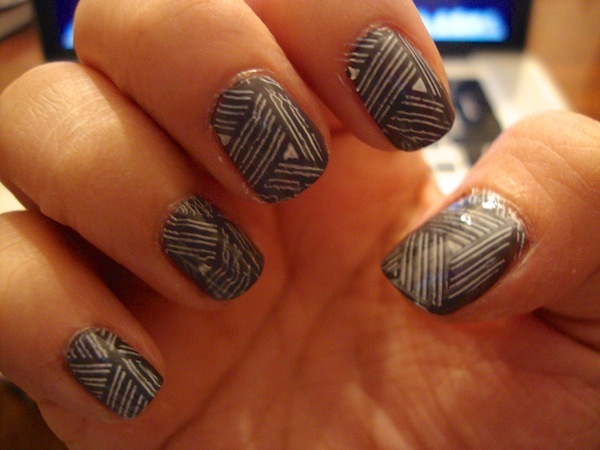 Using a white polish, apply it to the geometric design on the plate. Using the scraper, scrape off excess polish. Quickly use the stamper and roll/press it onto the design. 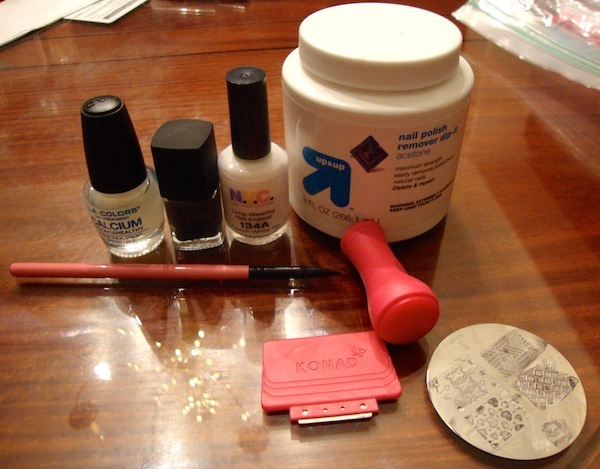 Quickly line up the stamper with your nail and roll it onto the nail. Repeat on all your fingers. Wait for the design to dry for a bit and apply a top coat. Letting the design dry will prevent smearing. That’s it for this quick Mani Monday! I hope you enjoyed and that everyone has a lovely week! PS. if you want to see the rest of the designs on this plate, be sure to check them out here. If you’ve subscribed to my feed, that will definitely work. Even if you don’t have a WordPress account, you’ll be notified via email whenever I update. Aww! Thank you! Your comment just made my day. 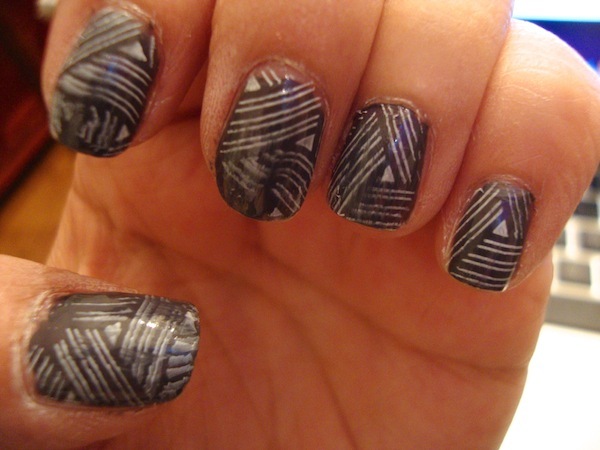 I know what you mean, this was my first real attempt at stamping and I was really pleased with the outcome. I went with something simple because I knew I would get frustrated if I tried something too crazy. I’m still working on getting better myself! Thanks again for stopping by, and if you like what you see, please subscribe! Yeah, I completely agree! I’m hoping that once I get more plates, I can get a feel for what looks good without being overwhelming.